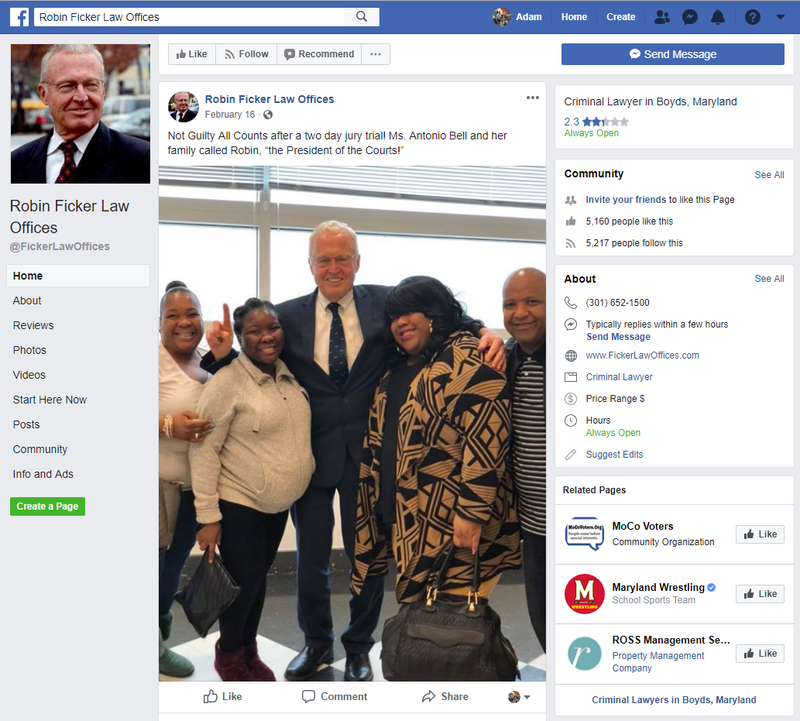 Is Ficker Using Public Financing to Promote His Law Practice? County Executive candidate Robin Ficker is enrolled in the county’s public financing program and has announced that he has qualified for $231,185 in public matching funds. Those funds are supposed to be used to finance his campaign for office. 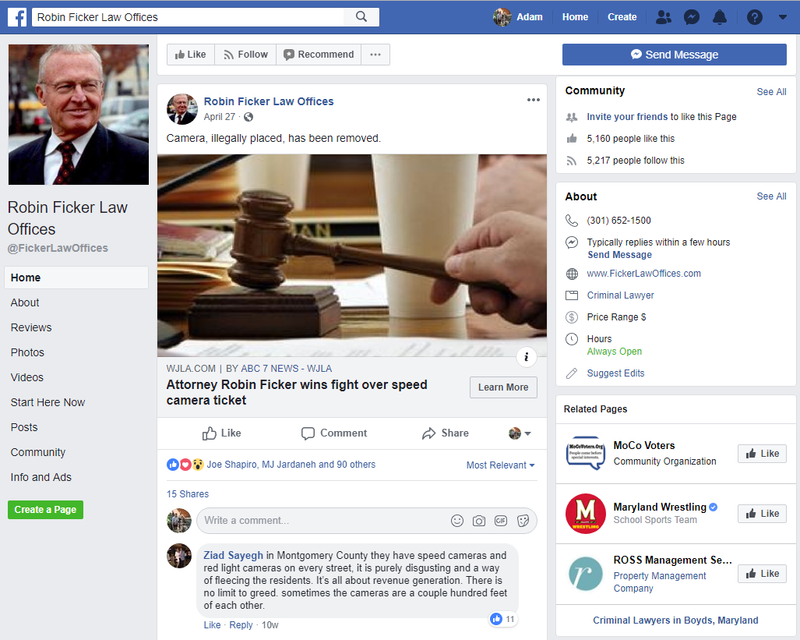 But his Facebook ads raise the question of whether he is also using them to promote his law practice. 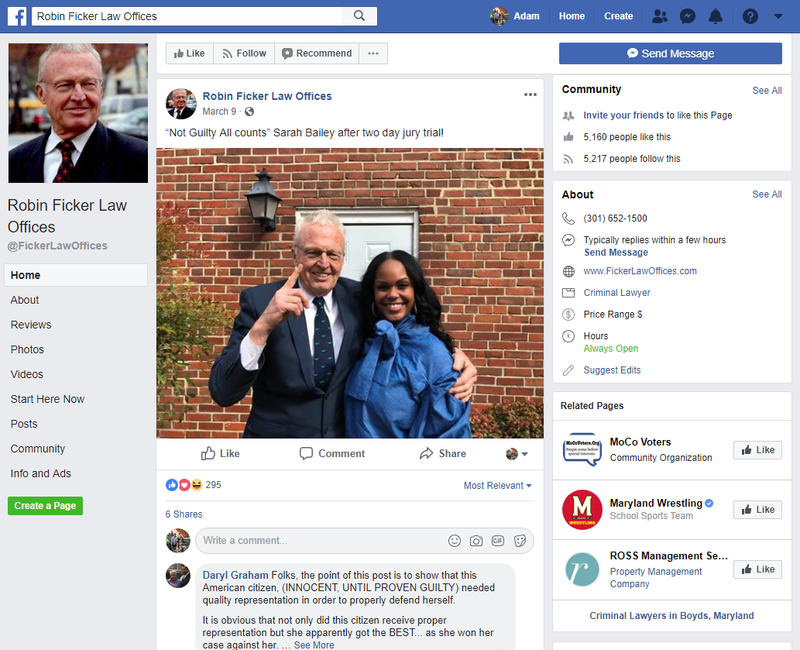 Ficker has run at least three political Facebook ads from his Robin Ficker Law Offices page. The content of the ads is unquestionably political. But the Facebook page is a mixed bag. It advertises his services as a criminal defense lawyer and has his business phone number. It also offers a combination of political content and promotion of Ficker’s legal work. To be fair, Ficker’s ads do not advertise the legal posts. But whenever a voter sees one of his political ads, they see “Robin Ficker Law Offices” at the top. 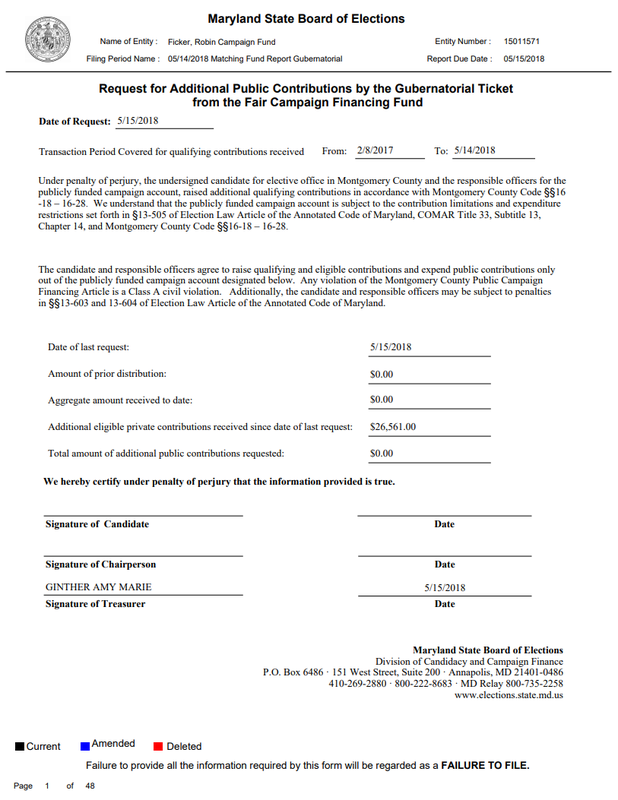 Maryland COMAR 33.13.10.03 prohibits the use of campaign funds for “the personal use or the personal benefit of a candidate.” Montgomery County COMCOR 16.21.01.05 prohibits the use of public financing funds for “personal use.” Whether Ficker is running afoul of these regulations is a matter for the authorities. 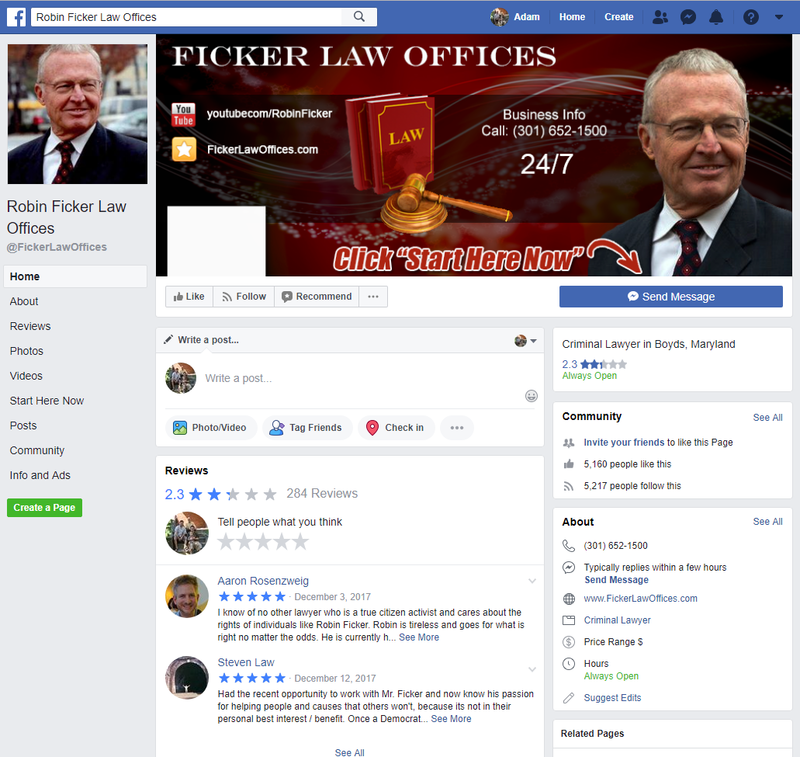 But if he wants to avoid this issue entirely, Ficker should establish a political Facebook page that is separate from his business. That’s what other candidates do and Ficker should do the same. This past primary saw the first use of public campaign financing in local elections in Maryland. Many people both inside and outside Montgomery County have been watching the system’s performance. For the benefit of both MoCo policy makers as well as those in other jurisdictions who are considering adoption of this system, here are the things we have learned about public financing. Public financing was heavily used and helped attract a record number of candidates. Thirty-three candidates enrolled in public financing. Four of them ran for Executive, nineteen ran for Council At-Large and ten ran in Council Districts. Of these candidates, twenty-three qualified for matching funds – all four Executive candidates, twelve Council At-Large candidates and seven District candidates. That’s a 70% qualification rate. 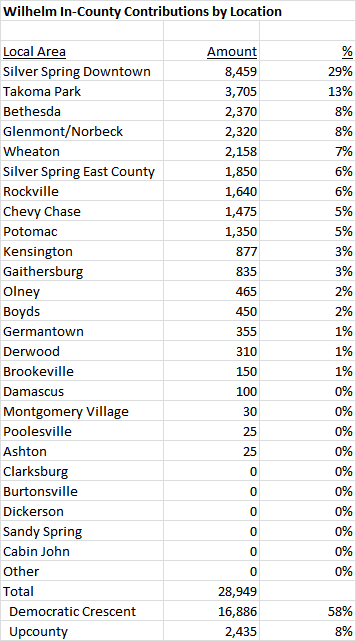 MoCo has never had as many candidates for county office as it had this year – not even close! – and public financing was partially responsible for that. Several candidates told your author that they would not have considered running if public financing had not been available. Candidates in public financing can win. Of ten county-level seats, six – Council District 3, Council District 4 and all four Council At-Large seats – were won by candidates in public financing. Three of these winners were incumbents and three were not. The County Executive seat may also be won by a publicly financed candidate pending absentee and provisional ballot counts. But did public financing change the outcome? The three incumbents who used public financing and won did not need the system to win. Of the three non-incumbents who won while using it, we predicted that two – Council At-Large candidates Evan Glass and Will Jawando – would be strong contenders more than a year ago because they had run credible races before. The third non-incumbent public financing winner, Council At-Large candidate Gabe Albornoz, would have at least been a viable candidate in the traditional system because of his endorsement by the Washington Post and his networks in the party, the community and among Ike Leggett supporters. The leading Executive candidate in public financing, Marc Elrich, has long outperformed his fundraising and benefited from significant outside progressive support. In no instance can we point to public financing as THE reason a candidate who was otherwise not viable became a winner. In fact, if all candidates had used the traditional system, it’s possible that the exact same group of them would have won. It was cheaper than expected. The county set aside $11 million in its public election fund on the assumption that there would be many new candidates and that a lot of them would max out in public matching funds. Yes, there were a lot of candidates, but only four – Council At-Large candidates Evan Glass and Will Jawando, Council District 1 candidate Reggie Oldak and Council District 3 incumbent Sidney Katz – maxed out. Two more Council At-Large candidates – incumbent Hans Riemer and Bill Conway – came close and County Executive candidate Marc Elrich was not far off. As a result, the county spent $4 million in matching funds distributions through the end of June – waaaaaay less than the $11 million in the public election fund. Incumbents did well in the system. In his 2014 race, Council At-Large incumbent Hans Riemer raised $271,817. Four years later in public financing, Riemer raised $326,866 through June – a 20% improvement. Council District 3 incumbent Sidney Katz raised $135,589 in 2014. Four years later in public financing, Katz raised $176,265 through June – a 30% improvement. Council incumbent Marc Elrich, who ran for Executive, raised $851,602 through June, a higher total than he had raised before and enough to let him compete with a multi-million-dollar self-funder. Fellow council incumbent George Leventhal, who also ran for Executive, had decent fundraising with $628,426 but his campaign was hurt by front-loaded spending and few endorsements. The system did not produce credible challenges to district incumbents. Council District incumbents Craig Rice, Nancy Navarro and Tom Hucker blew out little-known challengers. In the latter case, Hucker’s challenger actually qualified for matching funds and sent out two negative mail pieces but was still wiped out by 45 points in early and election day voting. In the only competitive district race, District 3 incumbent Sidney Katz used public financing to defeat Ben Shnider, who ran in the traditional system. The lack of competitiveness in district races is a long-standing trend that public financing has not changed. Public financing was administratively challenging. While no users of public financing told your author that they regretted participating in the system, all of them complained about its cumbersome administrative requirements – especially showing proof of residency to obtain matching funds and dealing with filing issues in the state’s software. The State Board of Elections has every right to verify in-county residency before authorizing release of public funds, but the system’s ease of use should be reviewed by the next County Council. Raising money in public financing takes a long time. We wrote about this during the campaign. Because the system relies on a large volume of small contributions, contacting those MANY small contributors takes a long time to pile up serious cash. Late entrants into public financing like County Executive candidate Rose Krasnow and Council At-Large candidate Jill Ortman-Fouse were unable to match competitors in fundraising who also used public financing. The lesson here is if you are going to use this system, start running early. Self-funders did not overwhelm the system. In the County Executive race, public financing candidate Marc Elrich fought self-funding David Blair, who gave his campaign at least $2.9 million, to a virtual draw. In Council District 1, Meredith Wellington – who gave her campaign $78,000 – is on her way to finishing fourth behind public financing candidates Ana Sol Gutierrez and Reggie Oldak. Self-funding was not a major factor in the Council At-Large race. Public financing did not stop interest group participation in the election. Interest groups may not have been able to contribute large individual, corporate and PAC checks to candidates but they still played. They spent significant amounts on TV and mail in the Executive race and some progressive groups canvassed for their candidates. Just as importantly, institutional endorsements mattered as much as ever. Marc Elrich could not have come close in the Executive race without them. District 1 candidate Ana Sol Gutierrez benefited from them to finish second even though she had lackluster fundraising. District 3 candidate Ben Shnider had many and came closer to winning than most people initially believed. And all four winning Council At-Large candidates (incumbent Hans Riemer, Will Jawando, Evan Glass and Gabe Albornoz) had lots of them. Candidates who lacked interest group support, like Executive candidates Rose Krasnow and George Leventhal and Council At-Large candidates Hoan Dang, Bill Conway and Jill Ortman-Fouse did not come close to winning. Savvy interest groups can exploit public financing by helping candidates of their choice raise money inside the system while using their own money to finance PAC and independent expenditure activity. Here’s a prediction: all of the above will happen again. Most women using public financing did not win. Much has been said about the next County Council having just one female member. District 4 incumbent Nancy Navarro used public financing to defeat a no-name challenger. But no other woman in public financing came that close to winning. In early and election day voting, Gutierrez trailed traditionally financed candidate Andrew Friedson in District 1 by seven points. Krasnow finished third in the Executive race by fourteen points. And the highest-performing woman in the Council At-Large race was Marilyn Balcombe, who used traditional financing to finish fifth. There are numerous reasons to explain these finishes. 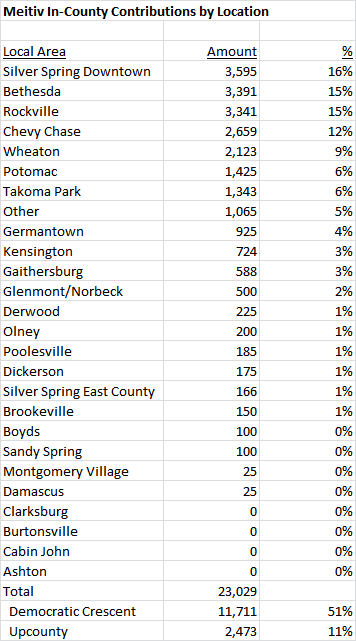 Gutierrez’s primary voter base was in Wheaton, which is outside District 1. Krasnow and Council At-Large candidate Jill Ortman-Fouse raised money quickly but started too late to raise a lot of it. Council At-Large candidates Brandy Brooks and Danielle Meitiv were unknown in county political circles before running so they could not tap into preexisting donor networks. We believe that female candidates can succeed in the system, but we admit that this cycle presents little evidence of that. Public financing amplified the influence of the Democratic Crescent. We have written before about the Democratic Crescent, the region of the county stretching along the Beltway from Takoma Park in the east to Cabin John and Bethesda in the West. This area has a disproportionate number of Democratic activists, voters and political contributors and sent Jamie Raskin to Congress two years ago. Back in March, we found that the Crescent accounted for a majority of public financing contributions to Executive and Council At-Large candidates and waaaaay out-paced contributions from Upcounty. If we were to repeat that exercise today, we have little reason to believe that the result would be significantly different. The impact of Crescent participation was clearly seen in the Council At-Large results. Riemer, Glass and Albornoz live in the Crescent. Jawando lives outside it but much of his base in Legislative District 20 is inside it. All four oppose M-83, the Upcounty highway demanded by many in Clarksburg. There has only been one At-Large Council Member from Upcounty since the current council structure was created in 1990. 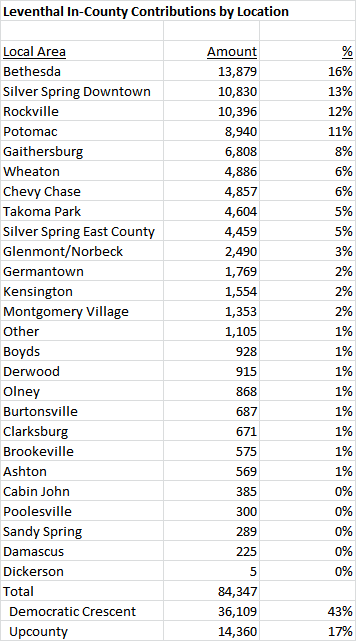 That person – Gaithersburg resident Mike Subin – has an asterisk since he was originally elected in District 2 in 1986 and shifted to an at-large seat when the new structure was put in place four years later. 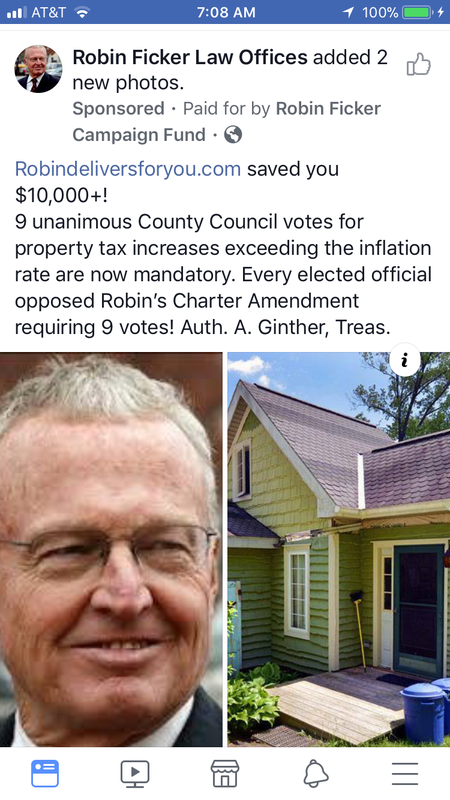 And so the trend of not electing Upcounty residents to at-large seats was well established prior to this year but we wonder if public financing will lock it in. We have spent $4 million on public financing so far. Was it worth it? We laid out the pluses and minuses above. Readers, this question is for you to answer! Update: Council District 5 candidate Kevin Harris has also filed for matching funds on May 15, claiming $12,400 in qualifying contributions from 176 in-county residents. Original Post: Council District 1 candidate Jim McGee filed for public matching funds on May 15. His filing claims 157 qualifying contributors and $36,580 in qualifying contributions, above the respective thresholds for a district race of 125 and $10,000. Two other District 1 candidates have qualified for matching funds, including Delegate Ana Sol Gutierrez and Reggie Oldak, who has already applied for the maximum amount ($125,000) available under the program. On Monday, we wrote that county law stated that the qualifying period for matching funds ended 45 days before the primary, which this year fell on Saturday, May 12. That is true. But at the time, we did not know that the State Board of Elections had allowed candidates to file as late as May 15 with only qualifying contributions received by May 12 eligible for matching funds. A reader brought that to our attention and we updated the post. But we are gonna own this one: we screwed up. Your author apologizes to Jim McGee and Seventh State readers. Then there is Robin Ficker, who is running for Executive in the public financing program. Ficker registered his public account on 2/8/17 and so far has not qualified for matching funds. (The other Executive candidates in public financing – Marc Elrich, George Leventhal and Rose Krasnow – qualified some time ago.) Ficker told Bethesda Magazine that he was unaware that he was subject to the 45-day qualifying period because he has no primary opponent. In order to qualify for matching funds, Executive candidates need 500 contributions from individuals living in the county totaling at least $40,000. Ficker then sent an application for matching funds on May 15 but it asked for… zero dollars. Can anyone figure this out for us? Because we admit it – we can’t! Update: Even though the deadline is May 12, the State Board of Elections said on March 30 that they will allow a candidate to file for matching funds as late as tomorrow (May 15) provided that all qualifying contributions were received by May 12. We will see if any of the above candidates file reports by tomorrow night. Original Post: According to Montgomery County’s public campaign financing law, candidates have until 45 days before the primary election to qualify for public matching funds. Since the primary is on June 26, the qualifying period ended on Saturday, May 12. 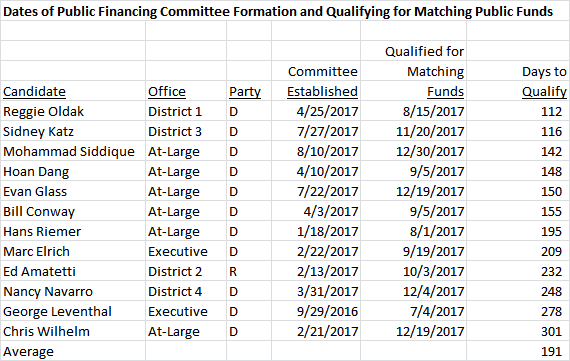 According to filings with the State Board of Elections, the following candidates did not qualify for matching funds by then and will not be receiving them. 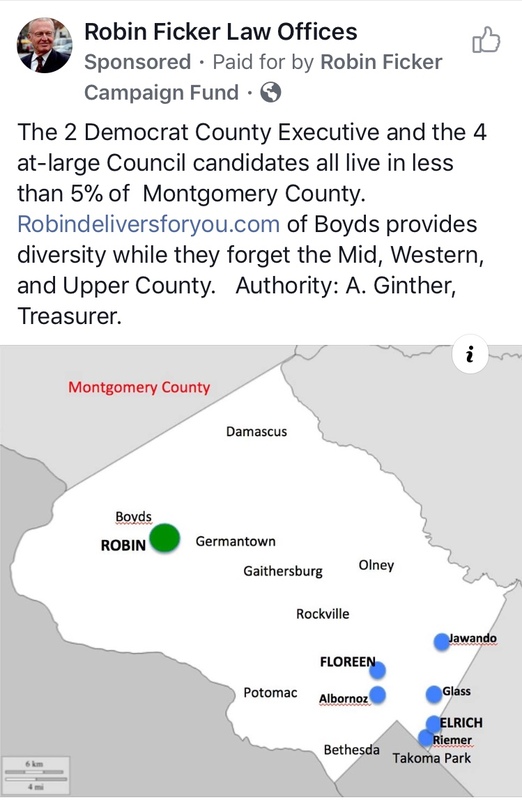 In addition, Bethesda Magazine reported that these candidates were ruled ineligible for matching funds because their submissions to the State Board of Elections did not meet the thresholds of either in-county contributors or in-county money received to qualify. These eighteen candidates represent almost half of the thirty-eight active candidates in public financing. Starved of resources and unable to get their messages out, none of them will be elected. We conclude with the remaining five Council At-Large candidates who have qualified for matching funds in public financing. Wilhelm, an MCPS teacher, is becoming a progressive darling of the Council At-Large race with endorsements from MCEA, the Laborers, Progressive Maryland and the Democratic Socialists. His contributions are heavily tilted towards the very liberal areas of Downtown Silver Spring and Takoma Park. The question for Wilhelm is whether he can hang with the other strong competitors going for those same votes, especially Hans Riemer, Evan Glass, Will Jawando, Danielle Meitiv and Seth Grimes and find a way to break into the top four. Wilhelm is a smart and passionate campaigner so don’t count him out. 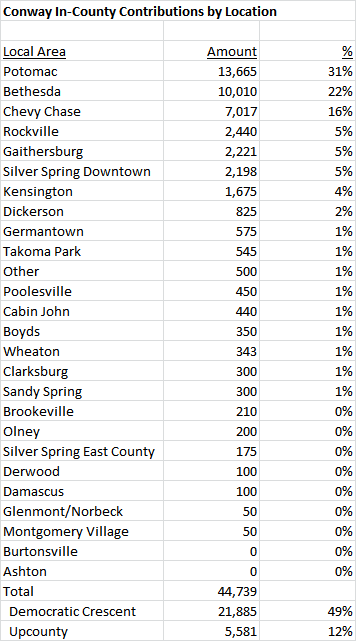 Jawando is the leading fundraiser in Silver Spring East County, which we define as zip codes 20903, 20904 and 20905. This area overlaps with the section of District 20 in which he performed best in his 2014 race for Delegate. Jawando has put together a long list of institutional endorsements that exceeds even the race’s sole incumbent, Hans Riemer, and includes the Apple Ballot. (He was also endorsed by the Laborers Union shortly after we published the latest list.) Now Jawando has to raise enough money to get the word out and finish the job. If he does, he will become just the second Council Member of color to win an At-Large seat after Ike Leggett left in 2002. Meitiv, the famous Free Range Mom, is so far the only female at-large candidate who has qualified for public matching funds. (Shruti Bhatnagar came close but has been ruled ineligible by the State Board of Elections. Brandy Brooks says she has enough contributions to qualify but has not yet filed with the state.) Meitiv’s contribution geography resembles the all-candidate average and is largely based in the Democratic Crescent that is so critical to winning countywide elections. If she continues to raise money, her status as one of the few competitive at-large women will help her in a primary electorate that is nearly 60% female. The good news is that Siddique is the second-leading fundraiser in Gaithersburg ($5,515) after George Leventhal ($6,808). The bad news is that he has a minimal presence in Democratic Crescent areas like Chevy Chase, Downtown Silver Spring and Takoma Park that are critical to countywide performance. Grimes, a former Takoma Park City Council Member, has collected a majority of his contributions from the city with relatively little money coming from elsewhere in the county. 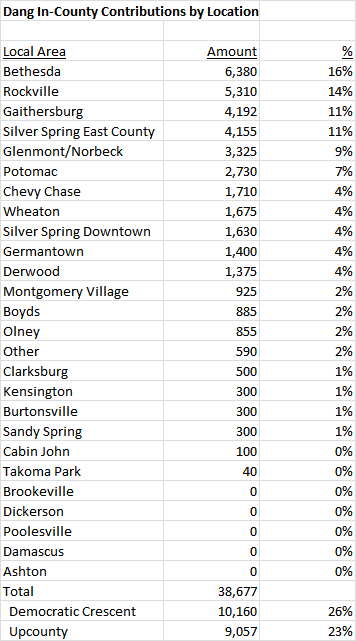 Takoma Park is not a big enough base from which to win a countywide election by itself. Grimes needs to pick it up elsewhere to have a chance for victory. Let’s start looking at the Council At-Large candidates who have qualified for public matching funds. 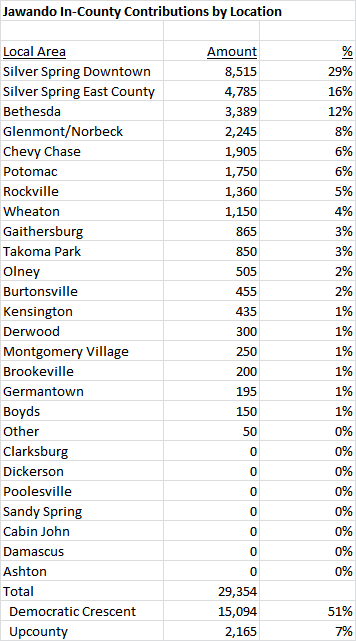 Here is an amazing fact: in a public financing system that includes multi-term incumbents like Riemer, Marc Elrich and George Leventhal, first-time candidate Bill Conway is the number one fundraiser in both Potomac and Chevy Chase. He has also done well in Bethesda. Conway could use more exposure in Silver Spring. 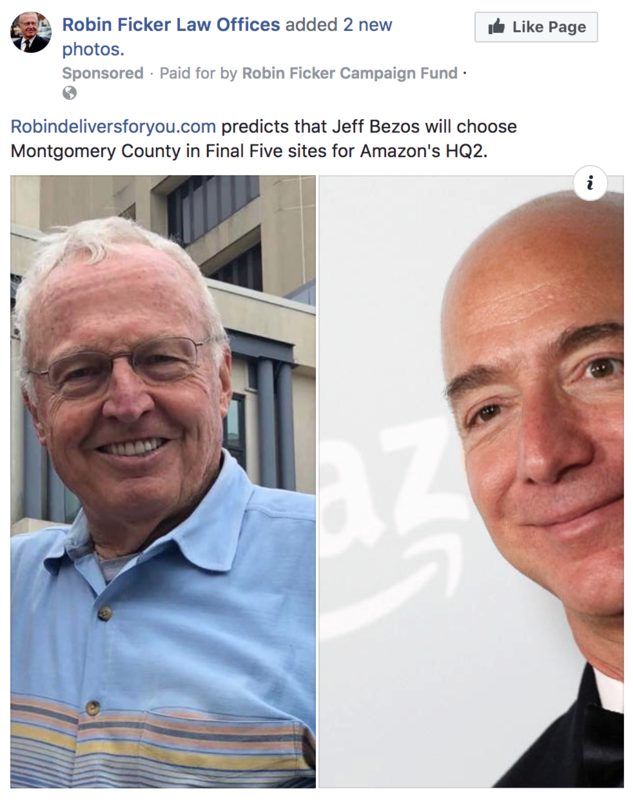 If he gets that, he could combine a top two or three performance in Bethesda, Chevy Chase and Potomac with a smattering of votes in other areas and get a ticket to the County Council. Second-time candidate Evan Glass, who almost won the District 5 seat four years ago, has a decade-long history of civic leadership in Downtown Silver Spring which is reflected in his fundraising. Glass has raised almost as much money there ($18,573) as has Marc Elrich ($20,763). 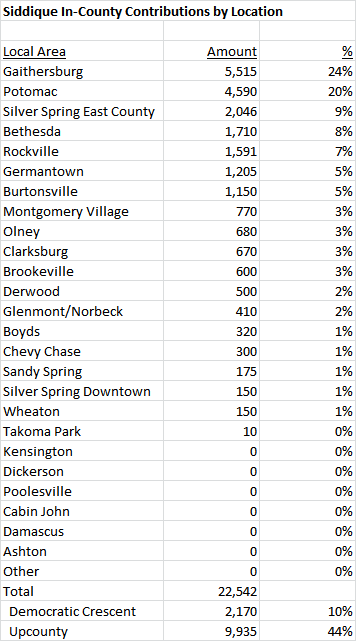 Glass needs to grow his base, with the logical targets being other areas in District 5 like East County Silver Spring, Burtonsville, Takoma Park and Forest Glen as well as western parts of the Crescent. As it is, he has a good shot to win. Dang is also a second-time candidate, having finished fifth of six candidates in the 2010 District 19 Delegate race despite doing a good job in fundraising. Dang has done pretty well in public financing but he is not dominating anywhere and has not shown a lot of strength in the Crescent. He could use some institutional backing and more support in places like Bethesda and Downtown Silver Spring to increase his chances of victory. County Recreation Department Director Gabe Albornoz is by far the leading fundraiser in Kensington, where he has a large base of family and friends. Other than that, he is not among the fundraising leaders in any of the county’s Democratic strongholds. Albornoz has three useful networks: his professional network from his day job, the contacts he has accumulated during his service on the county’s Democratic Central Committee and the supporters of County Executive Ike Leggett, who has endorsed him. Albornoz needs to continue to monetize those networks and get a couple key endorsements, like the Washington Post. If he can do that, he has a path to victory. We will finish looking at the Council At-Large qualifiers tomorrow. It’s time to start looking at the geography of in-county contributions for the thirteen candidates who have so far qualified for public matching funds: County Executive candidates Marc Elrich, Rose Krasnow and George Leventhal and Council At-Large candidates Gabe Albornoz, Bill Conway, Hoan Dang, Evan Glass, Seth Grimes, Will Jawando, Danielle Meitiv, Hans Riemer, Mohammad Siddique and Chris Wilhelm. While all participate in the same system, there are immense differences between them in where they are raising money. Long-time Council Members Marc Elrich and George Leventhal lead in public financing fundraising. But former Rockville Mayor and Planning Department staffer Rose Krasnow is closing on them. Krasnow qualified for matching funds in 109 days, far faster than Elrich (209 days) and Leventhal (278 days). All three lead the Council At-Large candidates in total raised primarily because of the higher public matching rate for Executive candidates. Riemer, Conway and Glass lead the council candidates while Meitiv, Siddique and Grimes trail. The fact that some candidates last reported two months ago while others reported within the last few weeks will affect this data somewhat. Including the traditionally funded candidates, Roger Berliner so far leads the Executive candidates while Delegate Charles Barkley is one of the Council At-Large leaders and Ashwani Jain is competitive. Here’s an important thing to note about public financing: it’s not just about money. It’s also a cornerstone for a field program. The same folks who show up at campaign events and bring small checks are the people who can be tapped for neighbor-to-neighbor letters, canvassing, phone banking, lit drops and poll coverage. The total amount raised is a useful proxy for the number of ardent supporters, so money raised in a local area may be a possible, partial precursor to actual electoral performance. Now to the three Executive candidates. Elrich is the number one fundraiser in Downtown Silver Spring, Olney and Takoma Park, the latter by a mile. His contributions have been heavily concentrated in the Democratic Crescent, which accounts for 53% of all in-county contributions and 68% of in-county contributions to Elrich. 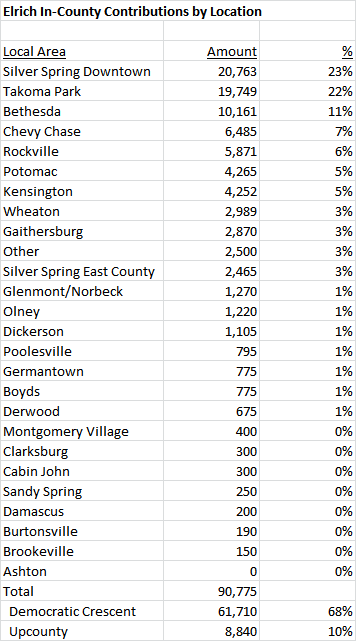 This resembles the Downcounty support for Jamie Raskin in his 2016 race for Congress. 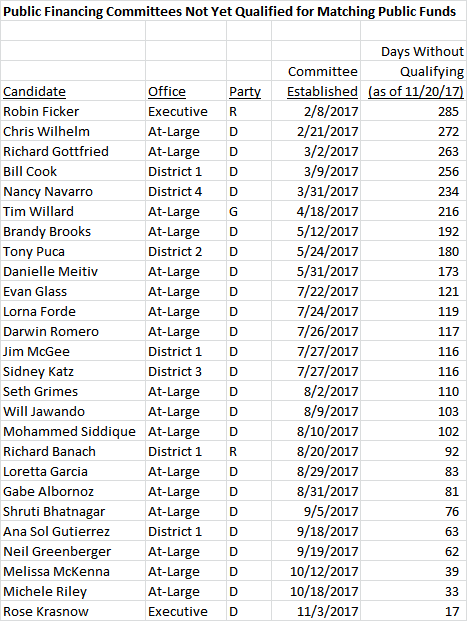 That distribution along with Elrich’s number one finish in the last two at-large elections and his many progressive endorsements makes him the front runner in the eyes of most observers. Leventhal, a former Chair of the county Democratic Party, has leveraged his more than twenty years in county politics to assemble the most geographically diverse contribution distribution of the Executive candidates. He is the number one fundraiser in Bethesda, Gaithersburg, Germantown and Montgomery Village. Leventhal leads Elrich in Upcounty but trails him by a lot in the Democratic Crescent. 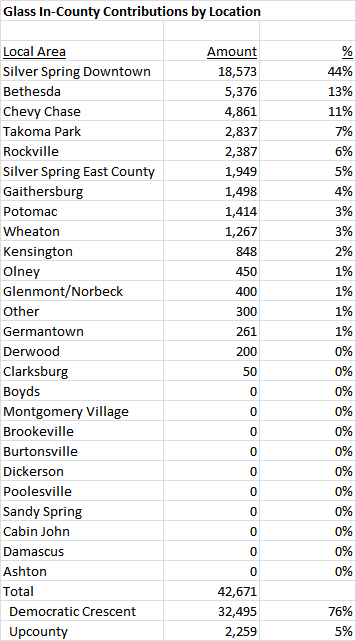 Can Leventhal pull enough votes from Midcounty and Upcounty to overwhelm Elrich’s strength in Silver Spring and Takoma Park and break through? Krasnow was an elected official in Rockville between 1991 and 2001 and she is crushing both Elrich and Leventhal in money raised from the city. On the other hand, she trails them badly in the Democratic Crescent. 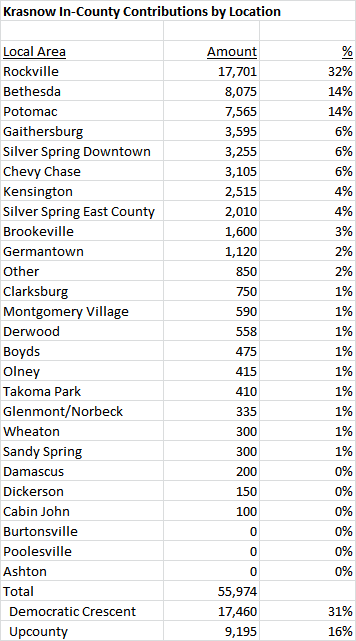 Krasnow is off to a fast start in public financing but she needs more exposure in Downcounty areas like Downtown Silver Spring, Bethesda and Chevy Chase. Elrich and Leventhal have been working those places for years and time is getting short. Next, we will start looking at the Council At-Large candidates. Disclosure: the author is a publicly-listed supporter of Berliner for Executive. This year’s election cycle is the first one in which public financing is being used in MoCo’s county-level races. That is one of many reasons why this election is historic in nature. So far, we know the following things about public financing: it is heavily used (especially in the Council At-Large race), it is administratively challenging, it requires a long time to raise money, it is less costly than first thought and while it creates opportunities for new candidates, it confers huge benefits on incumbents. Also, as predicted, the system reduces the influence of corporate interests and PACs. But who is stepping into that vacuum? This week, we will explore where contributions to publicly financed candidates come from. Participation in the system is optional; candidates can stay in the traditional system and many of them have done so. Candidates in the public system may only accept contributions from individuals up to $150. They cannot take money from corporate entities or PACs and must limit self-financing to $12,000. Contributions from in-county residents are matched by the county on a sliding scale. For Executive candidates, a $150 in-county contribution gets a county match of $600. For council candidates, a $150 in-county contribution gets a county match of $450. Candidates must meet thresholds of in-county money raised and numbers of in-county contributors to qualify for matching funds and are subject to caps of public fund receipts. And if a candidate applies for matching funds and does not meet the thresholds, that person can be ruled ineligible for matching funds. To examine the origins of contributions in public financing, we accumulated the contribution records of thirteen candidates who have qualified for matching funds: County Executive candidates Marc Elrich, Rose Krasnow and George Leventhal and Council At-Large candidates Gabe Albornoz, Bill Conway, Hoan Dang, Evan Glass, Seth Grimes, Will Jawando, Danielle Meitiv, Hans Riemer, Mohammad Siddique and Chris Wilhelm. We did not include contributions to district-level candidates like Sidney Katz, Nancy Navarro and Reggie Oldak because their receipts will inevitably be skewed to their districts, thereby introducing a geographic bias into the data. We also did not include contributions to non-qualifiers because they may not ultimately receive matching funds. One important consideration with examining these accounts is that not all of them have last filed on the same dates. While some were current as of the last regular report in January, others have filed as recently as last week. That’s because once a candidate qualifies for matching funds, they can apply for new distributions at any time through fifteen days after the general election. One important constraint for late starters: candidates in the system must qualify for matching funds by 45 days before the primary. Since the date of this year’s primary is June 26, that means the qualifying period ends on May 12. This analysis involved an examination of nearly 9,000 records. We asked two sets of questions. First, where are in-county contributions eligible for matching funds coming from and how do they compare with both the population and regular Democratic voters? Second, what are the differences in contribution geography between participating candidates? Those differences contain illuminating clues to the appeal and strategy of the candidates which could ultimately decide the election. We will begin unveiling our results in Part Two. Happy New Year, folks! After a relatively quiet period in the fall, December saw a number of applications for public matching funds from county candidates participating in public financing. One of the many positive things about public financing is that when candidates apply for matching funds, they have to file full reports with the State Board of Elections. That gives data junkies like your author – and Seventh State readers! – lots of updated data without waiting for the relatively few regular campaign finance reports in the state’s schedule. The next time all campaign finance reports are due, both from public and traditional accounts, is on January 17. The candidates below have met the thresholds for matching funds and have applied for those funds from the state. A few notes. The column titled “Non-Qualifying Contributions and Loans” refers to loans from candidates and their spouses (up to $12,000 is allowed) and out-of-county contributions, which are allowed but not matched. The column titled “Adjusted Cash Balance” includes the cash balance in the last report plus the most recent matching funds distribution requested but not yet received. It is the closest we can approximate the financial position of each campaign at the time they filed their last report. The column titled “Burn Rate” is the percentage of funds raised that has already been spent. Generally speaking, candidates should strive to keep their burn rates low early on to save money for mail season. Mohammad Siddique’s totals are preliminary as there are a few issues in his report that will have to be resolved with the Board of Elections. And District 4 Council Member Nancy Navarro applied for $35,275 in matching funds but cannot receive them unless she gets an opponent. Below is the number of days each candidate took to qualify for matching funds. Let’s remember that the thresholds are different: 500 in-county contributors with $40,000 for Executive candidates, 250 in-county contributors with $20,000 for at-large council candidates and 125 in-county contributors with $10,000 for district council candidates. So what does it all mean? Here are a few thoughts. Council Members Marc Elrich and George Leventhal, who are using public financing and running for Executive, have been active in county politics for a long time. Elrich first joined the Takoma Park City Council in 1987 and has been on the county ballot in every election since. He has been an elected official for thirty years. Leventhal worked for U.S. Senator Barbara Mikulski and was the Chair of the county Democrats in the 1990s. He played a key role in defeating a group of Republican Delegates in District 39 in the 1998 election. Both of these fellows have built up large networks of supporters over many years and they have done well in public financing, raising similar amounts of money from similar numbers of people. The difference between them is burn rate. Leventhal is spending much more money than Elrich early, with some of it going to a three-person staff. He had better hope this early spending is worth it because if this trend keeps up, Elrich could have almost twice as much money as Leventhal available for mailers in May and June. One of Council Member Hans Riemer’s advantages as the only incumbent in this race is the ability to raise money, and he has put it to good use in public financing. Riemer leads in number of contributors and total raised. He has also maintained a low burn rate. This is Riemer’s fourth straight county campaign and he knows what he’s doing at election time. His biggest problem is that his name will be buried near the end of a VERY long ballot. The five non-incumbents who have qualified for matching funds have raised similar amounts of money so far. As a group, they are not far behind Riemer. The one who stands out here is Bill Conway. Hoan Dang, Evan Glass, Chris Wilhelm and Mohammad Siddique all filed in December while Conway last filed in September. Our bet is that when Conway files next month, he will show four months of additional fundraising that will put him close to Riemer’s total. That said, the five non-incumbent qualifiers have so far separated themselves from the rest of the field. Gabe Albornoz and Danielle Meitiv have said they have qualified but have not filed for matching funds with the state. No other candidates have claimed to qualify. Raising money in public financing takes a long time and raising a competitive amount (at least $250,000) takes a REALLY long time. Those at-large candidates who do not qualify soon risk appearing non-viable. The county has so far set aside $11 million to cover the cost of public matching funds. That appears to be waaaaaay too much with only $1.4 million so far disbursed. Our guess is that the ultimate total will be less than half what was allocated and will be even lower in the next election cycle with fewer seats open. Five council incumbents are using public financing. All five have qualified for matching funds and have done so fairly easily. We will see how the challengers stack up, particularly in the at-large race, but so far the only at-large incumbent (Hans Riemer) is leading. As we predicted last April, public financing is good for incumbents because it allows them to leverage their networks into lots of small individual contributions. State legislators and other County Councils should take heed. That’s it for now, folks. Come back in a couple weeks when all reports, including those from traditional accounts, are due and we’ll put it all together for you! Former Council Member Phil Andrews’s public financing system is in use for the first time during this election cycle. 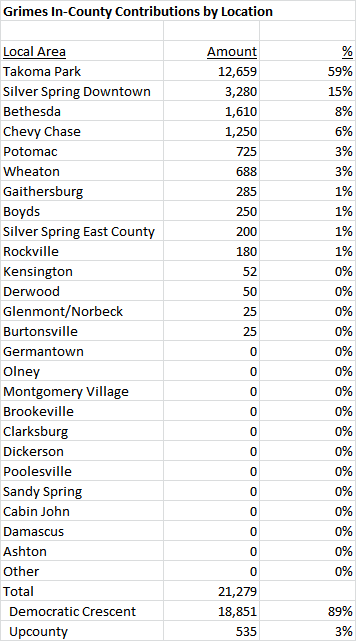 It has already changed MoCo’s political landscape, with 33 county candidates – a majority of those running – so far enrolled. It’s a bit early to say exactly how it will impact specific races, but two facts about the system are starting to become clear. It’s cumbersome to use. And candidates who use it need a long time to raise money. We have already written about the burdensome administrative aspects of the system, especially in demonstrating residency of contributors. (The system only provides matching public funds for in-county individual contributions of up to $150 each.) An additional difficulty is meeting the thresholds for triggering eligibility for matching funds. In order to collect matching funds, Executive candidates must receive contributions from 500 in-county residents totaling at least $40,000; at-large council candidates must receive contributions from 250 in-county residents totaling at least $20,000; and district council candidates must receive contributions from 125 in-county residents totaling at least $10,000. So far, just seven of 33 participating candidates have reached the thresholds for public matching funds. Council District 1 candidate Reggie Oldak was the fastest to qualify, hitting the threshold in 112 days. But Oldak is a district candidate, meaning that her threshold is the lowest, and her district is the county’s wealthiest with the greatest concentration of political contributors. At-large council candidate Hoan Dang hit his threshold in 148 days, barely beating out Bill Conway (155 days). Council Members Marc Elrich and George Leventhal, who are running for Executive, needed more than 200 days each to qualify despite having large donor bases going back many years. Then there are the other 26 candidates who have not yet qualified. Six of them have been running for more than 200 days. (District 4 incumbent Nancy Navarro will only be eligible to receive matching public funds if she gets an opponent.) Eleven more have been running for at least 100 days. Many of the non-qualifiers have been working hard for months. It’s just tough to meet the thresholds. Why is it taking so long to get matching funds? One reason is that Andrews, the system’s architect, did not design the system to be easy. He explicitly intended that public dollars only go to candidates who were viable in the sense that they had actual grass-roots support. Another reason is the nature of fundraising itself. Candidates who raise money turn to families and close friends first; past contributors next (if they have run before); then extended networks of professional connections, acquaintances and supporters’ networks; and finally complete strangers. As each network gets further away from the candidate, the marginal difficulty of raising dollars increases. In a public financing context, the first fifty contributions are easier than the next fifty, which in turn are easier than the fifty after that. The last few contributions to reach the threshold are the hardest to get. 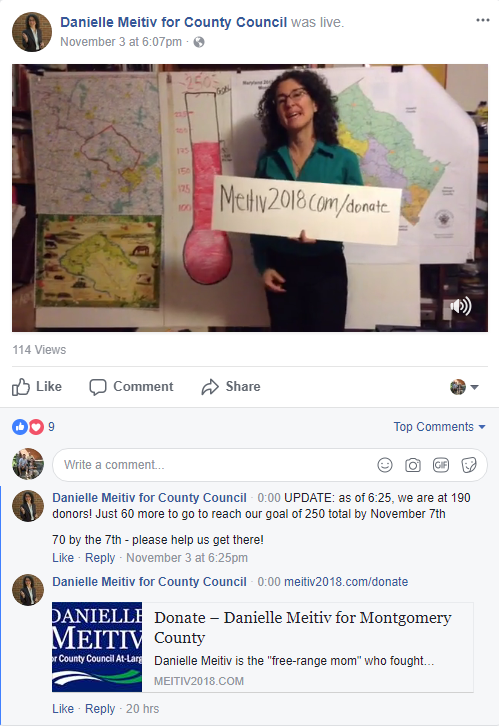 At-large candidate Danielle Meitiv has been working to hit the threshold with a video on Facebook. Similar observations can be made about traditional fundraising with this exception: the private system has no single trigger that activates a stream of cash all at once. The candidates in public financing will be weeded into two groups: the ones who get matching funds and the ones who don’t. The latter group will be doomed to failure. There’s one more lesson here for candidates: don’t get into a race late and expect to raise lots of money quickly through public financing. Even if you have a history of donors going back more than a decade like Elrich and Leventhal, the public system is not built for speed. If you are a late starter, chances are you will need either traditional fundraising or self-financing to close the gap and have a chance to win.